Cheese Puff dancing to "Make 'Em Laugh" from "Singing in the Rain"
This summer we rented "Singing in the Rain." I thought the boys might like it, and I love Gene Kelly. Cheese Puff loved it! But not Gene Kelly. He loved Donald O'Connor. We had the movie for two weeks, and every morning he wanted to play "Make 'Em Laugh" while he did his best to recreate Donald O'Connor's dance steps. I think he did a great job. I was sad to return the movie. Oddly, he hasn't wanted to check it out again. I'm thinking he might get it for Christmas anyway. I've not been posting very regularly. I'm kind of wrapped up in this upcoming play. Since introducing Little Elvis to plays with our local children's theatre group, I've managed to work my way up from parent to costume person, to co-director, to director/president of the group. This isn't because of my extensive background in theatre, music or child management. No, this is because I'm just like Ado Annie from Oklahoma! (Bob's favorite musical) I'm just a girl who cain't say no to any group asking me for help. So, yeah. I'm trying my best. There are 45 kids in this play! All three of my boys are in it, even though Cheese Puff is technically way too young -- he's supposed to be 5. My excuse is that I'm there, and he knows all the songs and dances anyway. And he's really cute. He's not so cute when he won't stop talking out in the audience, though. He's got a thing for older ladies, and has really charmed a 5th grade girl, and a 1st grade girl. The first grader even wore her pajamas to Thursday night's practice to be like him. So, he's a trend-setter and lady-killer. Directing a play is way different than doing costumes, or bringing your kid to practice. There's so much to take care of, and I'm doing my best to keep up with it all. I tried to do lots of prep work, which helped us out for the most part. I say us, because my assistant director is a total rock star. She's been great, and I couldn't have done this without her. She was in band in high school, and is much more musical than I am. That helps a lot with the musical numbers. We also have two board members who have been involved for decades that are really helping us out. For the most part, our parents have been great. Which helps. We have several moms (and Bob) working on sets, which are almost done and super-cute. We have several moms working on costumes, and they are done! They are low-key (my preference for kids' costumes) and very cute. We have an amazing mom on fundraising who has done stuff I didn't know we could do, and I'm struggling to keep up with her great ideas. It never occurred to me to ask for sponsors for shows. There's a reason I'm not a fund-raiser. We have super-crafty moms who are making cute kiddy bags that we can sell to the actor's parents. They also want to paint faces before the plays. We have a lot going for us, but I'm still over-whelmed. I know the parents that sit through practice (I've asked them to, to help manage the kids when they aren't on stage) must think I'm crazy and terrible. I'm doing my best, and I think it will work out, but I question myself on an hourly basis. This is a nice big cast, with a LOT of new faces. I don't want to run these kids, or their parents, off with my bad job of directing. I also fuss at poor Little Elvis a lot. He's got a decent part, and is doing pretty well with it. But he gets wild, and it makes things difficult for me. When the kids act up, I tend to blame him for showing them that it's ok not to obey me. He's been a little better, and he's doing a great job with his part. Baby Plum's missed a lot recently for soccer. That's probably the thing that frustrates me the most. I haven't seen any of his soccer games this fall, and I won't get to because of practice. My dad takes him. He scored a goal last Thursday, and I missed it. I hate that. I stay home. I should be able to watch my baby score soccer goals. I'm glad my dad's able to go, though. Baby Plum has someone there cheering him on. That's it. I will now get back to posting about cute little boys. Although it most likely won't be regular for a few more weeks. 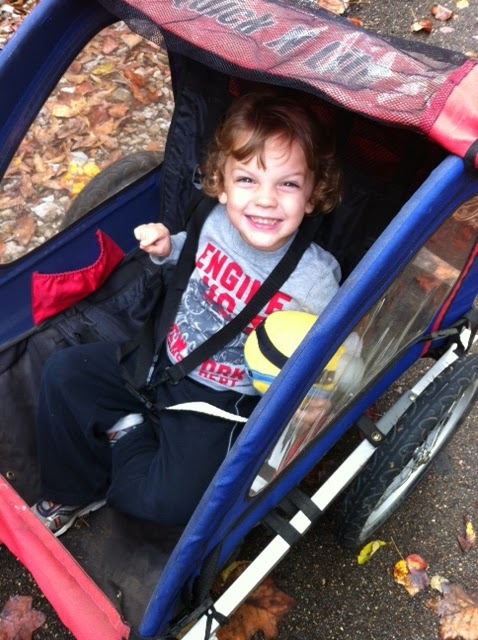 While Gram and Coachpa took his brothers to a football game, Cheese Puff went on a bike ride with Mommy and Daddy. We tried out a relatively new trail about 30 minutes from our town. It's really pretty, and was a nice ride. He enjoyed himself. See? He's holding his new minion toy that he spent some of his money on. It's a ball minion. He's happy, but he won't sleep with it. "It's not a sleeping toy!" We also finally decided to get our countertops done. My plan in the spring of 2014 was to get new countertops. Then the tornado hit, and they were put on the backburner. It took us forever to order them, and we were glad to just have one boy with us. He did a pretty good job, considering we were sitting and waiting for a long time. Another college game? Lucky boys! 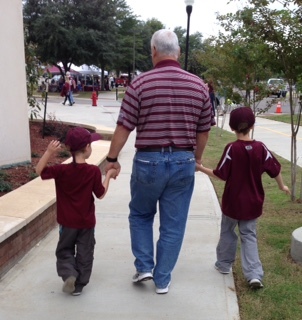 Since the last trip to a Mississippi State game was a success (except for the loss,) Baby Plum and Gram decided they wanted to go with Coachpa and Little Elvis. 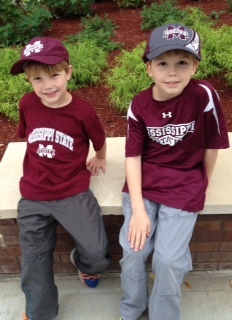 So, they made another trek for a Saturday game day. This was not nearly as big of a game, and it was a day game. It was much earlier, and not nearly as crowded. Baby Plum's never been a big hat wearer, so he really didn't keep his hat on too much. As my blondest baby, I say he shouldn't hide that pretty head of hair. Little Elvis has always been a good hat wearer, and he kept his on the entire time. Here they posed on a bench. They wore gray pants. Baby Plum doesn't like jeans and cried when I pulled out a pair. So, we went with gray windpants. 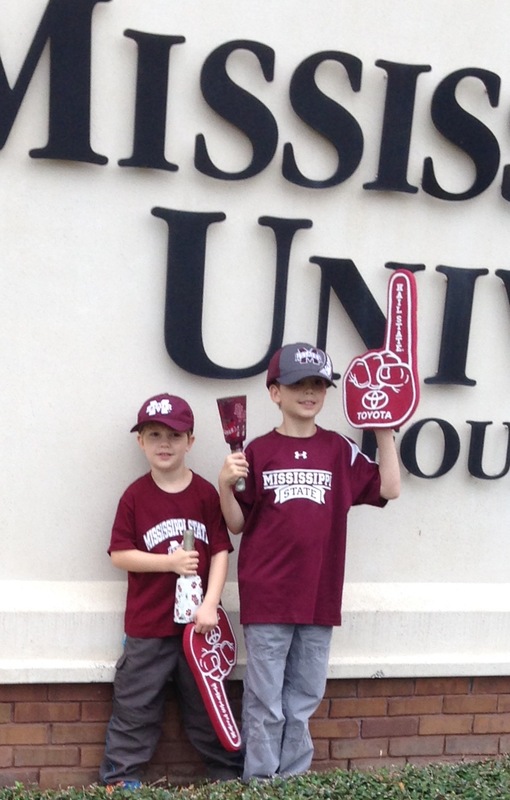 Posing in front of the sign with their number 1 fingers and cowbells. My dad said that Little Elvis had a big time, and is really getting into the game. Baby Plum's harder to read. He's not as emotive (word?) as his big brother. (Not many people are.) He says he had fun, and I believe him. He's the kind that will be content in most places, especially if those places include his big brother... and food. My mom said Baby Plum's best times came with food. He had a countdown the entire morning until lunch at the cafeteria (where he didn't eat much) and then a countdown until he could get a box of popcorn. 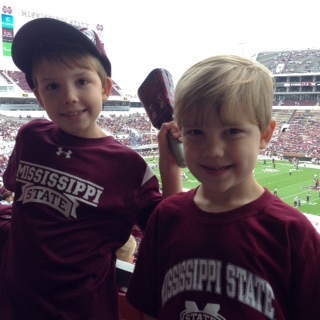 When asked about the game this morning, he told his friends that he got popcorn and Gram got a Diet Coke. So, if you feed Baby Plum, he will be happy. The team also won! Go Bulldogs! I haven't posted about Little Elvis recently. I took this picture on Baby Plum's birthday when the camera was already out. Little Elvis had already eaten once, but after brushing his teeth and getting ready, he opted to take a bowl of dry cereal to go. Some mornings he completely forgets to eat. Other mornings he can't get enough. He ate two suppers this evening. One before his football game and one after. He also had running club today, so it's a very active afternoon for him. He still loves football. He likes watching it, and seems to enjoy the games he plays. But he doesn't always pay attention during the game. He got to play a lot last week, but didn't get to play as much tonight. Bob says he's getting better at defending, but isn't great at blocking when he's on offense. He's got one more game I think, unless they make the playoffs.